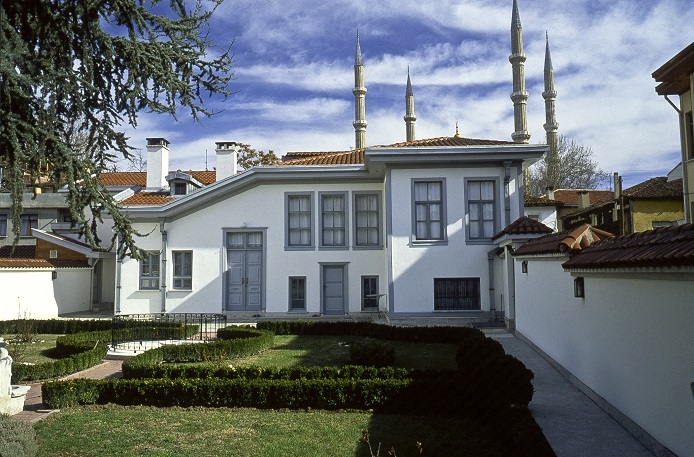 The first time I had the chance to enter a Bahá’í holy place was when I visited Bahá’u’lláh’s house in Edirne. Never before had I been able to visit one of our holy places without fear. The experience was one I will always remember. We journeyed by rental van from our hotel in Istanbul to Edirne. The trip took about one hour. The landscape along the way was lush and green, and, as we traveled, we prayed and sang Bahá’í songs. The whole way, our hearts brimmed with a unique kind of happiness—spiritual joy. Edirne is a small city with majestic mosques and beautiful municipal buildings, but the beauty and majesty of its buildings is nothing when compared with the magnificence and dignity of the Exile it harbored many years ago. When we arrived in the vicinity of the holy house, the custodian welcomed us and led us to the house. Half Iranian and half Turkish, Tahirih Khanum spoke Persian with a sweet Turkish accent. She was lovely, just like her name, which means “a chaste woman” and was the name of one the first disciples of the Báb. We entered the back part of the house, where there was a reception area and an office. There we had breakfast and visited with a Bahá’í couple from Iran who had emigrated to Saudi Arabia. They told us about the restrictions Bahá’ís were subject to in their country and the challenges of living with those restrictions. If they even mentioned their beliefs to their Muslim neighbors, they explained, they would be arrested and jailed. Despite the difficulty of the subject, we felt happy to be able to sit in the blessed house and speak freely with Bahá’ís from other countries about subjects of concern to us. Then it was time to enter the main part of the holy house. First we passed through a small garden, which was carefully designed with many beautiful flowers. Next we descended into the basement of the building. Tahirih Khanum spoke a little about the house and its history, and she showed us some old pictures of the house. Finally, the time we had all been waiting for arrived—the time to climb the stairs to visit the rooms where the Blessed Beauty and the holy family had lived for five years. At first, I could not believe I was climbing the steps on which the Master had placed His holy feet. I felt honored beyond belief. As we slowly moved through the rooms upstairs, we meditated on what we saw and took time to pray. Some relics were displayed inside the rooms: a pen case that had belonged to ‘Abdu’l-Bahá and, to my amazement, a strand of Bahá’u’lláh’s hair and His turban. When I saw these things, my eyes filled with tears. When, at last, all of the pilgrims had finished their prayers, we proceeded downstairs to the basement again, where Tahirih Khanum gave us dried rose petals from the garden as a keepsake. Once we had placed these carefully in our prayer books, we posed for photos together. As we drove away from the holy house and the city of Edirne, each of us felt we had been imbued with a new spirit. I shall never forget my first visit inside a Bahá’í holy place. For me, the experience was entirely unique. When we visit a holy place in Iran, we can only view it from afar. Often we simply sit inside a car at some distance and say our prayers. Sometimes, the holy place has been destroyed and we see a modern building in its place so we have to pray only with an image in our minds of what the place must have looked like when it was still standing. Whenever we make such visits, we must be careful not to attract any attention. We must make sure to stay at a safe distance. But in Edirne, I had the indescribable bounty of seeing a Bahá’í holy place from the inside, and of making my pilgrimage with Bahá’ís from other parts of the world. My visit to Bahá’u’lláh’s house in Edirne gave me a glimpse of the glorious landscape of freedom, and, to me, a Bahá’í living in Iran, it seemed nothing less than a view of heaven. Bio: Rojin Ghavami studies English through the BIHE (the Bahá’í Institute for Higher Education). She lives in Karaj, Iran and works as an English teacher and a translator.